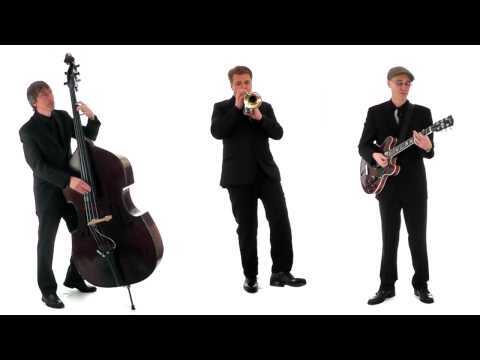 A swinging little 3-piece band with the sound of a full orchestra. Professional, friendly, and always a hit at the party. The Little Swing Band first started performing as a full 17 piece swing outfit, complete with a horn and string section. However the logistics of touring with a group this size (and the high fees it was necessary to charge) prompted us to do develop the trio. We wanted to keep the sound of the big band, so we hired players to come into the recording studio with us and record the strings, horns and drums. The result is we can keep the sound of the big band, and still bring all those great songs to our clients they way they are used to hearing them, without the huge set up, and price. The Little Swing band is made up of professional musicians, who have all played in great shows in the West End, as well as in Las Vegas, on cruise ships and with several named artists. The band are also able to provide a Michael Buble tribute show - just ask. Watch the chaps in action on the video to the right of this page. If you're interested in booking them or have any questions, just click the "enquire" button at the top of the page or add The Little Swing Band to your shortlist of favourites. We'll get right back to you with a direct price quote (no mark up) and we'll let you know if they're available on the date you're after. Simple! Sorry, The Little Swing Band doesn't have any photos right now Send us an enquiry and we'll get back to you, or check out the rest of the act profile.